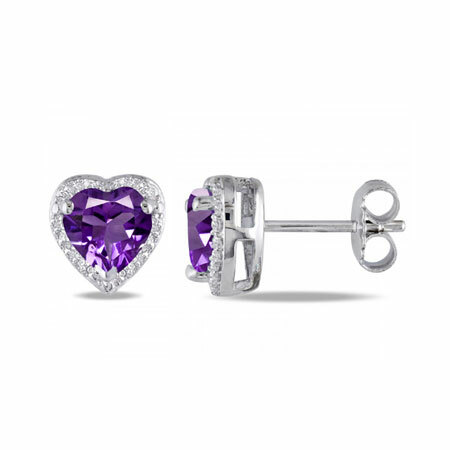 A true reflection of romance, this heart-cut amethyst stud earring set is simply cute and exquisite. The 925 sterling silver base is mounted on a single strand of sterling silver with a clasp at its end. The heart-cut amethyst gemstone which measures 8mm x 8mm seats on a heart-shaped sterling silver base which is further beautified with a halo of 0.11 Carat diamonds all around it, 36 in number. The shimmer of the 3.40 Carat amethyst on the stud earrings is irresistible to the eye and while deepened by the diamond halo, is a perfect way of showing love as it is guaranteed to pull positive attention from people who see it. We guarantee our Heart-Cut Amethyst and Diamond Halo Stud Earrings in Sterling Silver to be high quality, authentic jewelry, as described above.